Non-human primates (NHP) have the closest biological characteristics to humans and especially it is similar to humans in areas such as anatomy, physiology, disease, and cognition. Therefore, non-human primates are experimental animals that can not be compared with rats or experimental animals. For this reason, monkeys are widely used in biomedical and behavioral studies that are similar to human beings. The monkey has a brain and behavioral characteristics that more closely approximate those of the human, and thus is an important study subject as we evaluate the human brain function. 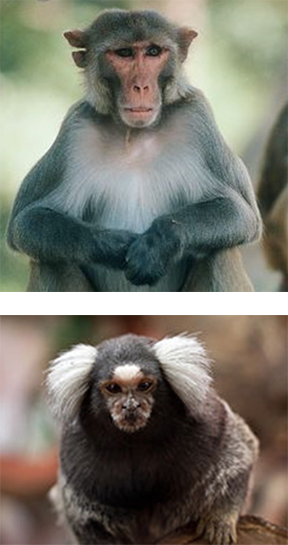 As a research subject, Monkey (Macaca mulatta) presents a unique set of features that make it an exciting brain system to study as well as a more difficult system to access through microdialysis. NeuroVIS is developing reliable technique to carry out NPH microdialysis which permits accurate placement of dialysis probes into cortexes, hippocampus and subcortical target areas (caudate nucleus, amygdala, nucleus accumbens, striatum etc.) of the monkey brain. The use of NPH microdialysis in areas such as the neurobiology, affective disorders, and psychosis will improve the understanding of the complex pathophysiologies of these neuropsychiatric disorders.